Ever have water in your ear after a workout? I know I get more water in my ears now, returning to the pool, then when I swam everyday. I always find it embarrassing when I turn my head a few hours after a long pool swim and notice water falling out of my head. 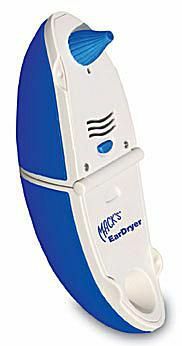 The Mack's EarDryer looks to stop ear falling out of your ear canal, helping dry your ears. If you are someone who has a lot of water in their ears after a workout, consider the Mack's EarDryer. This unique rechargeable device should be a consideration for any swimmer, especially Masters swimmers who often report water in their ears more than youth swimmers. The Mack's EarDryer is a small, portable, rechargeable ear dryer that works. If you have problems getting water out of your ears after a swim or a shower, or problems with swimmer's ear due to wet ears, the EarDryer may be the just what you need to remove that annoying water in your ears and help prevent swimmers ear. The EarDryer works. It was easy to use, the ear pieces were easy to clean, and the whole thing is small and light, making it easy to bring to the locker room. I tried the EarDryer for about a week, and had a variety of different age swimmers use it to dry their ears, too. The verdict - easy - the EarDryer works. It was easy to use, the ear pieces were easy to clean, and the whole thing is small and light, making it easy to bring to the locker room. This convenience plays a large role when you are taking our equipment and suit to the pool each day. To use the EarDryer, you put on a clean ear piece, push the start button, and put the ear piece in your ear. The EarDryer ear piece sits against your outer ear, you hear a soft whrrrr, then feel a gentle warm stream of air blowing into your ear. After about 1-minute, the device switches itself off - and your ear is dry. If you or someone you know has problems getting the water out of their ears or has reoccurring swimmers ear problems, the EarDryer may be the answer. It is a great way to get the water out of a swimmers ear without twisting and pulling on the ear or tilting the head and jumping up and down. The EarDryer is simple, fast, and reliable. Updated by Dr. John Mullen, DPT on September 29th 2015.